To date it would seem you either love or hate the Windows Phone platform, but the new 930 might just have what it takes to tease a few users of Android or iOS thanks to Windows Phone 8.1 and and the excellent Nokia hardware. I am still an avid Android user at heart, sold into the Google ecosystem. It has been a while since I have really used Windows Phone and when you ask a Nokia Lumia user what they think about their device, they often few have bad things to say. So I put the Lumia 930 to the test to see just how good it is. There is stiff competition on the market and the 930 starts strong with its specification list. Whilst it lacks the IP rating that is starting to become more common, the 930 is a very technically capable piece of equipment . At 167g and 9.8mm thick the 930 is one chunky device in comparison to many others, but it does include wireless charging and a whole host of other features so maybe this can be excused. Whilst it is big and a little bulky it is a bit of a beauty in my eyes. An aluminum frame gives the 930 a strong central core and the polycarbonate back panel gives us the iconic range of colours that Nokia offer. If feels solid in the hand, probably able to take a few bumps better than some others out there. There are touches of curvature to the front and back, minimal, but enough to give it a smooth and less square look and feel. Whilst the left edge is free of any ports or controls the right edge has volume and power key as well as a 2 stage camera button. The top of the device is home to the 3.5mm audio jack and nano sim card slot. On the bottom resides a microUSB connector. The glossy front panel has 3 touch sensitive keys despite Windows Phone now supporting software buttons, there is the ear piece, front facing camera, microphone and Nokia logo. On the back, there is no removable cover but you have a loudspeaker in the lower right corner with the 20 megapixel PureView camera located centrally in the upper third of the back panel with a dual LED flash to the left hand side. A microphone sits just above this too. The Lumia 930 is big and bold. It looks and feels like a workhorse and whilst sleek and svelte design is very appealing, a robust workhorse is too. The 930 has a 5” capacitive touchscreen with a resolution of 1920 x 1080. The pixels per inch (PPI) measures in at 441, which is not the highest of the flagship phones available, but is well on par for a device of this type. Corning Gorilla Glass gives an added bit of protection and should resist the majority of scratches and impacts on the screen. The colours are generally very good, with a good balance between them and the blacks being particularly black. If you are a stickler for screen colour accuracy and temperature you have the option within settings to change the colour profile. The 930 does not do too bad in really bright sunlight either. It is readable in almost all situations. Naturally a bit of reflection will always occur and fingerprints are visible, but is certainly seems to resist greasy fingers better than other displays. The screen is very responsive to touch and can be activated by a double tap on the screen when it is in standby. There is a bezel around the display and it is by no means as slim as that on the LG G3 or Huawei Ascend P7, but it does not feel as noticeable as the likes of the Sony Xperia devices and in my opinion is helped by many of the black backgrounds within the Windows Phone OS. The extra bezel thickness also helps retain an element of the robustness of the 930. It is very apparent that since my last encounter with Windows Phone that it has evolved quite considerably. The new notification centre in Windows Phone 8.1 is an absolute blessing as is the quick toggles which you can customise, along with the shortcut to the full settings menu. For anyone jumping from Android the Windows Phone, now is one of the best times to do so as the transition is less painful than it once was. I was able to easily add my Gmail account, sync emails, contacts and more. However if you are already deep into the Google ecosystem many things will be a challenge and possibly one too far for some to make the switch. The home screen can accommodate up to 6 tiles across the screen now, meaning more information and shortcuts to the items that matter. It is simple to resize and reposition them. You can now get a bit more creative with customisation by adding a wallpaper to the home screen. This relies on the tiles you have on the screen being ‘transparent’ to see the wallpaper and no tile at all does not mean you get to see the wallpaper. I understand why it is like this based on the tile system, but its just a bit of a disappointment. Out of the box there is a good number of apps and features available on the handset to get you up and running and of course you can add more through the store. Whilst apps are growing there is still a limit and many will miss some of their favourites found on iOS or Android. 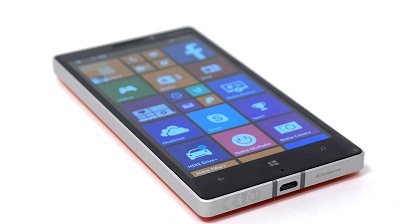 Out of the box the Nokia Lumia 930 has 32GB of memory of which around 25GB is available to you as the user. There is no scope for expansion though unless you take advantage of Microsoft One Drive which offers 7GB for free. If you wish to carry around your prized music collection, you may have to think carefully unless you use Mix Radio or Xbox Music or one of the few streaming services available on the Windows Phone platform. A different and bold look the platform has, but the live tiles and system layout can all become a bit heavy. It looks sleek and well designed, but as silly as it sounds the focus on design makes too many things blend into one another and makes it hard to find what you are looking for. Yes some tiles have louder colours but if you have a few vying for attention your eye easily gets led. The setting menu in my opinion best illustrates this more me. Little graphic icons would be considerably more helpful. General performance was good with little sign of slow down or lag. One noticeable thing though is that the 930 runs warm to the touch, in fact a lot of the time it runs very warm. Whilst within the tolerances set by Nokia, it runs warmer than my Z1 Compact and that can get quite hot. The drawback of fitting so much into a device? The Lumia lacks little in terms of connectivity. Bluetooth 4.0, WiFi including the 5GHz frequency, wireless charging, 4G, DLNA, GPS, GLONASS and NFC are all present. Video out and USB hosting are two features I feel are very desirable in a business environment. USB hosting is not present, the best you will get is sharing files by the cloud, and lets be honest that is how most now do it, although USB host ifs great for larger files. The ability to project your screen onto another display or projector is possible with project my screen, but Nokia Beamer allows you to share your screen with anything else like a TV or PC that has internet connectivity. The audio experience on the Nokia is spot on for a device of this type. It does not pack the punch and sheer volume of the BoomSound speakers in a HTC One, but there is good depth and strength to the audio that powers out from the 930 rear speaker. The positioning of the speaker means you are unlikely to muffle the sound and for those who are require an FM radio, the 930 has you covered. If you do not like what the Nokia produces then you need to consider a DSLR, because there is no other smartphone that can really provide quite the consistent performance that it can. The 930 uses the same 20 megapixel camera found in the Lumia 1520. The results speak for themselves. There is a good balance of colour with few signs of overexposure, if anything images verge on the side of underexposed. A great feature of Nokia products is that they have a dedicated camera shutter button. Video recording is possible up 1080p at 30 frames per second and what is particularly noticeable is the audio quality. The microphones on the 930 do a great job of picking up what is going on and this makes the video that much better. The camera offers 2x digital zoom, whilst up to 3x digital zoom is available during video recording. Particularly noticeable in the video recording is how smooth it is. There are also lots of controls for manual adjustment if you want to get the best possible results and if you are still not that happy with the final result Nokia Creative Studio allows you to add a few extra tweaks to the photo and make it just so. Whilst the results are good there are some negatives. Most of the other flagships can now record in full 4K, all be it they are normally limited to 5 minutes. The 930 can not. Whilst Nokia have aimed to make the camera and what it offers as feature rich as possible, the lenses option is actually a whole series of apps you can add to the device to to enhance the camera capabilities. It is a nice touch but is perhaps a little confusing on first glance. With a fixed internal battery of 2420mAh I expected the Nokia to do pretty well, and that it did. At an absolute push you might get 2 days out of it for the lighter user. A moderate user will get a good day and maybe nearly the full second if you are a bit clever about what you do. The power hungry users will still be looking for a socket come bed time unless you are a media mogul and then carrying a battery pack such as the DC-50 would be a good option. It is the media rich screen on time that kills the battery life, but for what I deem to be average use which includes emails, telephone calls, some web browsing and maybe an hour or two of video or media rich content then you can be confident that you can leave the house in the morning and will not need to dock the Lumia 930 until your head hits the pillow. Coming in at less than £450 including VAT at the time or recording, the 930 has an aggressive price point against its iOS and Android counterparts, but it needs that to pull you in and be won over. Included in the box of the UK version is a wireless charging plate which would normally add about another £30 to the price tag. There is no denying that the Nokia Lumia 930 is one of the best examples of a smartphone today. It is in my book the best example of a Windows Phone. Whilst it does not have the sleek curves of Apple or some of the added features HTC or Sony bring to their devices, Nokia have put their own additions that in the most part work. It is slightly bigger and bulkier but if feels solid and looks the part. If this is a disadvantage for you, this is easily outweighed by the camera, screen and audio experience the 930 has to offer. The OS is evolving all be it slowly and for anyone looking to switch now is one of the best times, just be aware of the limitations. If however you have a Windows PC, maybe a Windows tablet, then there is every reason to stick with Windows on your phone for that tight integration that you can get. The 930 is a superb piece of engineering and I wish I was not so deeply integrated into the Google ecosystem as it has a lot to offer. I hope Microsoft continue to provide such quality devices as they show more of their influences on what we know and love about Nokia.